The Rhube is an absolutely amazing cocktail that features XUXU Strawberry Liqueur and a splash of fresh rhubarb soda. This drink was created by Allen Katz, Director of Mixology and Education of Southern Wine & Spirits and host of Martha Stewart Living Radio's show, "Cocktail Hour." The drink is easy and the pairing of strawberry and rhubarb is a natural fit. Here they are worked into a perfect balance and The Rhube is perfect for any spring or summer party. Find more tips below the recipe. Shake the liquors, lime juice and simple syrup in a cocktail shaker with ice. Top with a splash of house-made rhubarb soda). Garnish with a fanned strawberry. To make rhubarb syrup, combine 6 cups chopped rhubarb stalks with 1 1/2 cups of sugar and 1 cup of water. Bring to a boil, stirring until all of the sugar is dissolved. Strain the syrup and refrigerate (for up to one week). Makes 20 oz. To make rhubarb soda, simply combine equal parts rhubarb syrup with chilled club soda or seltzer. XUXU is one of the best strawberry liqueurs I've had. 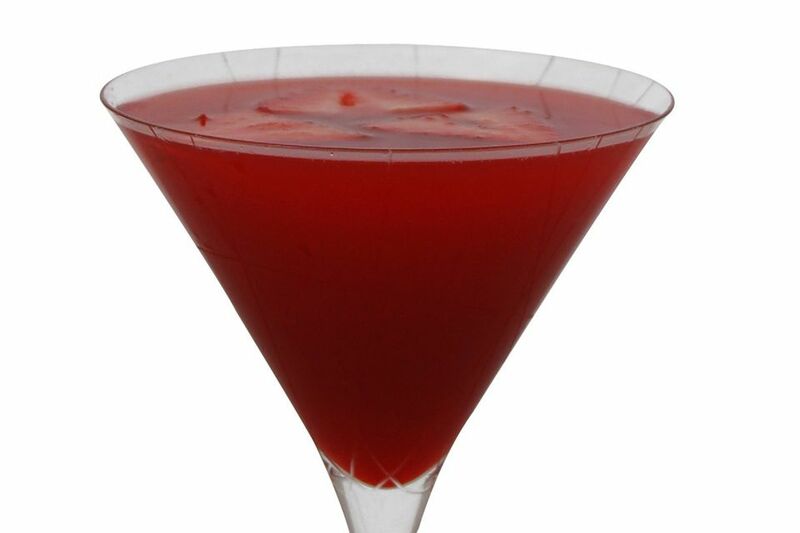 It is rich and luscious and has a sweet, thick feel that is perfect for drinks like this one. However, it is admittedly difficult to find and as of 2015, I'm having a hard time finding it in the U.S. While I hope that XUXU continues production and distribution, this is not an uncommon story in the spirits industry. For most of us, we will need to find a substitute. Fragoli, Bols, and Marie Brizard would be my top choices for strawberry liqueurs and they are all readily available. Next up is the rhubarb soda. Making your own is a great idea an a fun project that can be used in so many drinks. I use it all the time in recipes like this Virginia's Punch. However, when facing reality we know that DIY is not always an option and rhubarb is very seasonal. Thankfully we have a company like DRY Sparkling who makes a fantastic rhubarb soda year round. If you haven't yet, try it. The crispness is spectacular and rhubarb is the perfect soda flavor.